From past few years, like most other handheld gadgets, webcams have also gained huge popularity around the world. People are preferability using them for a wide range of applications including video calls, game recording needs, tutorial development and many more. You can easily fix the latest webcam units to your laptops and desktop computers to get started with high-quality video recording. Experts reveal that even if you have a high quality webcam, it is important to combine it with a reliable video capture software otherwise the content quality can get decayed. In order to become a successful blogger, you need to start working with the best webcam video software tools. But the great news is that it is not always necessary to make heavy payments to get something best. Below we have listed few webcam video capture software tools that are available for free and can be used by anyone around the world. Camera app works perfectly with Window 10 and Windows 8 operating system, and it also serves users working on Window 8 platform. Instead of facing the risks of spyware and malware attacks associated with other 3rd party software tools; it is better to start working with Camera App available on your system. This app is rated high for its simplistic interface and easy to use the platform. This software tool can process images with 4:3 and 16:9 aspect ratio. You will love to explore its framing grid options including Golden Ratio and CrossHairs. Users can easily crop, edit, filer, and process high-quality images on this window 10 based app. You can avail best results to your editing needs by combining Camera app with Photos app. With Camera app, you can record videos at 30fps frame rate that works perfectly with 360p, HD as well as Full HD recording. The user can make an easy selection of time-lapse and burst shirts mode to enjoy awesome recording experience. This software tool was launched by Rendersoft with lots of impressive features. This tool is available for free, and it provides video editing services to unlimited users throughout the world. It is possible to capture all screen movements directly, and they can be converted to AVI format as per need. 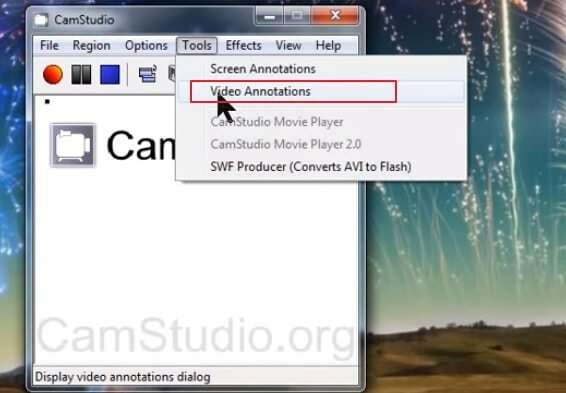 There is no doubt to say that CamStudio is an awesome piece of software with lots of potential editing features that can assist in the development of custom videos without eve demanding much efforts. You can enjoy easy video compression and screen recording abilities with this feature-rich software tool. Even beginners find this software tool easy to use; so, you can download it now by simply visiting the official website of sellers. Note that CamStudio is presently available for Window OS only so rest of the users may need to look for other potential solution online. If you are using Logitech webcam to fulfill your video recording needs; it is good to use awesome application from the same brand to edit your captured images. This tool supports only Logitech cameras and ensures incredible functionality for all editing needs. Users can capture images as well as videos using their Logitech webcam, and this software tool can process them without compromising for content quality. Once your images are videos are ready; you can share them instantly with social media platform such as Facebook. It allows one-click adjustments for all camera settings and videos can be processed with 720 and 1080p resolution level. It can also support your video calling needs while working perfectly with face tracking mechanism and active motion detection applications. Most users find it simple and easy to use with interactive workspace and well-adjusted settings. Experts say that it is probably the best software tool available for all Logitech lovers. Here is another advanced webcam software tool that can process webcam-captured videos in six different file formats including MOV, MPG, AVI, FLV, WMV, and MP4. Experts call it one of the fastest application for supporting webcam functionality and the great news is that it also allows easy sharing of videos on other platforms. This application is recommended to beginners for its super easy and interactive design layout. There are four basic buttons highlighted on the screen that can serve most of the editing needs. Free Webcam Capture tool is easily available on official website, and anyone can download it with ease, but the sad truth is that developers offer the least support for this software tool. Are you searching for an interactive screen recording tool that can meet your routine gaming video recording requirements? Probably FlashBack Express is the right solution for your needs. 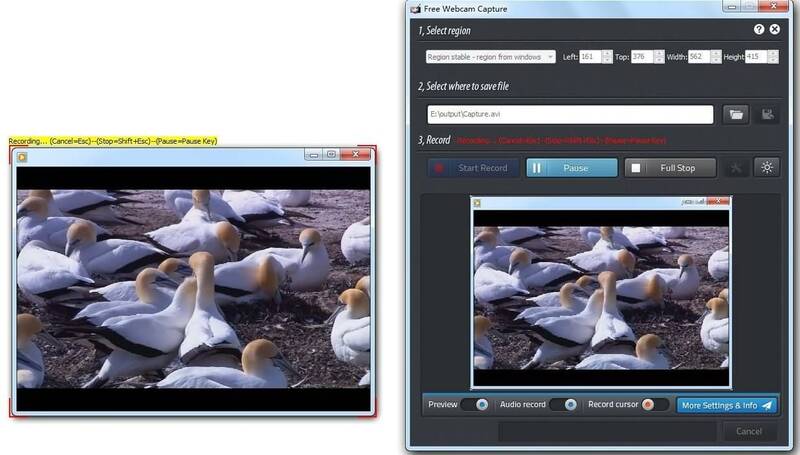 This tool helps users to capture high-quality footage from desktop computers that can be further shared on social media platforms with few clicks. The great news is that unlike many other free screen recorder software tools; FlashBack Express does not leave watermarks on processed videos and it not even pose any time limit on recordings. It can record high-quality sound from your desktop via webcam or external microphone and can create awesome tutorials and plat videos. FlashBlack Express is loaded with wide range of latest features that assist in the frame by frame editing, annotations, and picture-in-picture video development. 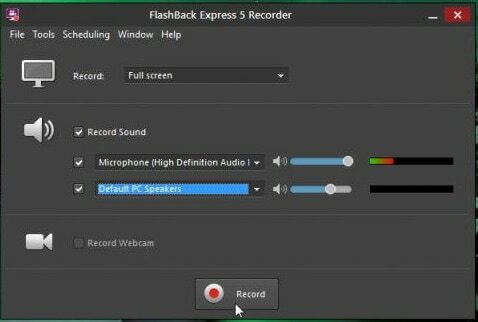 When you need full control of your recordings, FlashBack Express is the best companion for your all needs. Users can adjust custom resolution for desktop video recording, and it is also possible to hide specific icons, add plain background and limit overall file size for easy sharing on other platforms. If you want to record your desktop or your gameplay as well as the webcam at the same time, we recommend you to try Filmora scrn Screen Recorder Software.